It looks impressive, but this tart is simple to prepare. It's a good vegetarian option for Sunday lunch. Preheat the oven to 180°C, gas mark 4. Place a large baking tray in the oven. Heat the oil in a large frying pan and gently cook the courgettes for 6-8 minutes until they begin to soften and turn lightly golden. Add the garlic and capers, and cook for a further minute. Add the lemon zest. Remove from the heat and leave to cool. Break the eggs into a bowl and beat with the Greek yoghurt. Mix in the feta and most of the dill, reserving 1 tablespoon. Season, then stir in the courgette mixture. Cover the filo pastry sheets with a damp tea towel to stop them drying out. Taking 1 sheet at a time, brush with melted butter and place in a 20cm x 30cm rectangular or 23cm square loose-bottomed flan tin, allowing the edges to overhang slightly. Repeat with the other sheets, so they fill the tin and form a shell. Spoon the mixture into the pastry shell and place on the preheated baking tray. Bake for 20 minutes until the filling is set and lightly golden, and the pastry is crisp. If the edges start to colour too quickly, cover with foil. Leave the tart to stand for 10 minutes before cutting into slices, and scattering with the reserved dill and extra lemon zest. 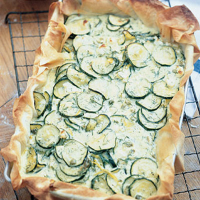 Serve with a tomato, cucumber and onion salad.